Set the pastry and berries out to thaw. Heat the oven to 400°F. Line a baking sheet with parchment paper. Beat the egg and water in a small bowl with a fork. Sprinkle the work surface with the flour. Unfold the thawed pastry sheet on the work surface. Using a star-shaped cutter, cut the pastry into 6 (about 4-inch) stars. Place the pastry stars onto the baking sheet. Brush with the egg, then sprinkle with the sugar. Carefully split each pastry into 2 layers. Just before serving, spoon about 2 tablespoons berries onto each bottom pastry layer, then top with about 2 tablespoons whipped topping and a top pastry layer. 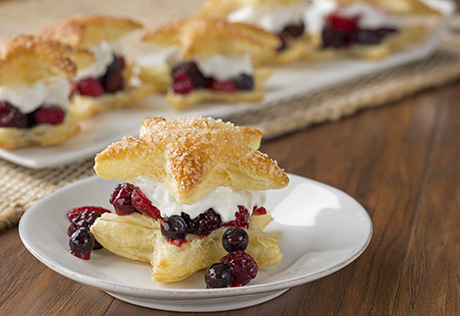 Keeping berries and puff pastry on hand makes it easy to create simple but beautiful desserts like this one in minutes.